Isn’t it amazing how food can evoke a memory? An emotion? One bite can bring you right back to the place that you first tasted the delectable delight. So, it is for me and the infamous ‘toad-in-a-hole’. I had my first taste in Australia. The trip of a lifetime with each moment solidly etched in my brain. My dear friend Catherine made them for us one morning at her home in Adelaide. I recently introduced my children to the ‘toad-in-a-hole’ and they LOVE it. My daughter asked for ‘toad-in-a-hole’ four nights in a row, for dinner! When asked what her favorite food is…you guessed it! Toad-in-a-hole. It is so simple and easy, and healthy too. Choose your bread. You can use any variety you prefer. We have enjoyed with our standard whole wheat but have also delighted in the flavor of sourdough. Generously melt butter in cast iron pan and turn heat to medium-low. Cut a hole in a slice of your choice of bread with a biscuit cutter or upside down glass. Lay the bread in the pan. I put the circle part in the pan too. 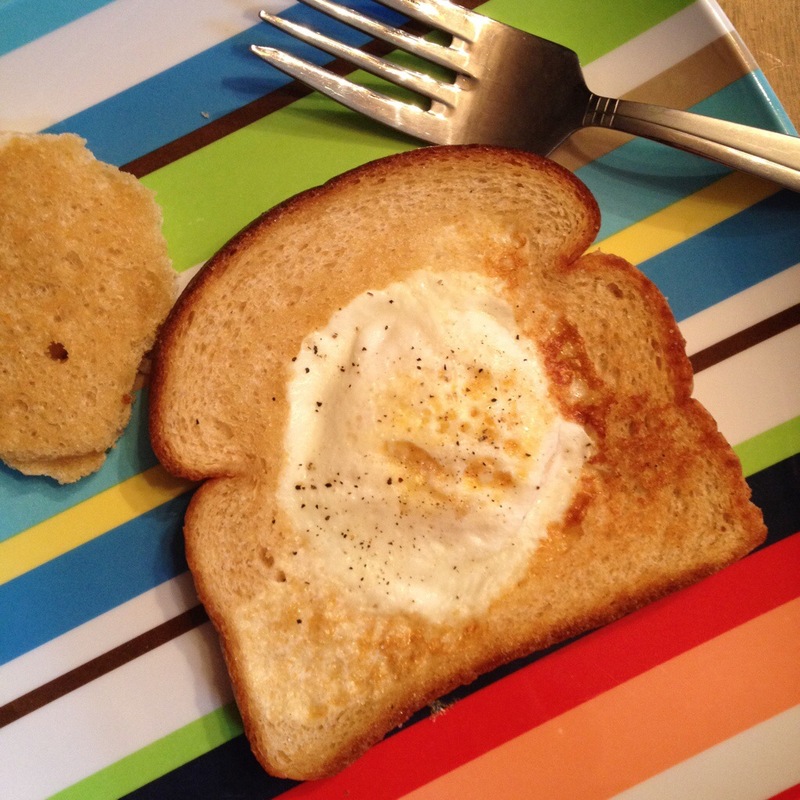 Let it toast a bit in the butter and then crack an egg in the hole you created in the slice of bread. Salt and pepper to your liking. Give it a good minute or so and then carefully flip so that the other side of the egg has a turn. You can cook to your liking for the yolk, runny or all the way through or anywhere in between. I also flip the circle here too so it gets nicely toasted on the other side. Remove from pan and serve. If you are looking for a new take on your egg and haven’t had the pleasure of this simple dish, I invite you to try it. While names abound, I prefer to call it ‘toad-in-a-hole’ as it was first served to me by my kind and gracious Aussie friend. Thanks Catherine – for bringing me back Down Under with a simple breakfast dish. Cheers! Thank you Jeannie! (I’m way overdue for a post.) They are so good and easy, and quick!